Kela’s Varda toilet brush set with toilet paper holder in striking black and white. 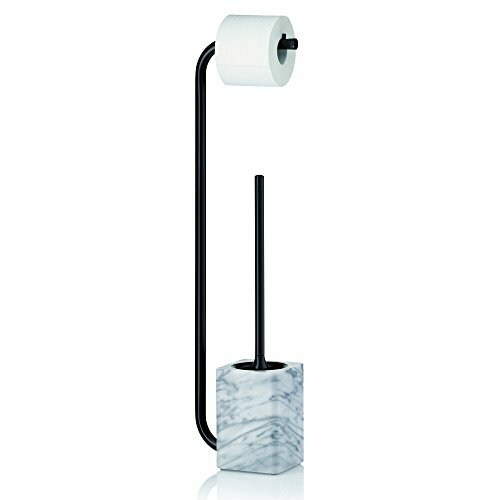 The toilet paper holder is constructed from black painted metal and the brush holder is manufactured in stylish heavyweight marble with a black plastic inner container. The matte black and white finish gives this bathroom accessory a unique look. Height: 28.1''. The Varda collection is extensive, enabling you to fully outfit your bathroom with matching accessories. If you have any questions about this product by Kela, contact us by completing and submitting the form below. If you are looking for a specif part number, please include it with your message.